A great many video cover comp designs were created for this specific title which has reunited both the �Ichabod/Headless Horseman� short cartoon and the �Mr. 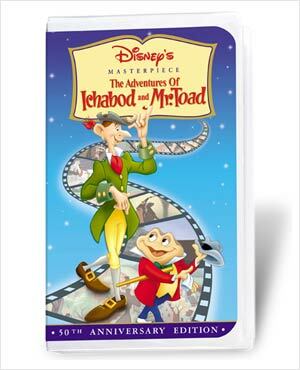 Toad� short cartoon, as it was originally released in theatres. Here you can view some of the comp designs and how they finally translate into the finished package art with minor changes. In the finished package art, the decision was made to flop the �filmstrip� background so that it appeared to face the other direction, as well as to use a revised title treatment. Further, the characters themselves were made somewhat larger to better utilize the space. When re-releasing this title again, the company chose to go back to these original comps I produced a few years before and create new packaging based on them.